You can substitute the swiss chard for any other greens or cabbage although, they may require longer cooking times. Roll out the pastry, line a 24cm tart tin and bake blind. Meanwhile, cook the onions in a the butter until softened, add the sliced stalks of the swiss chard and cook for a min or two more. Now add the leaves and cook until wilted, season well and add the nutmeg. Whisk the eggs and cream, season and mix in the cheese. 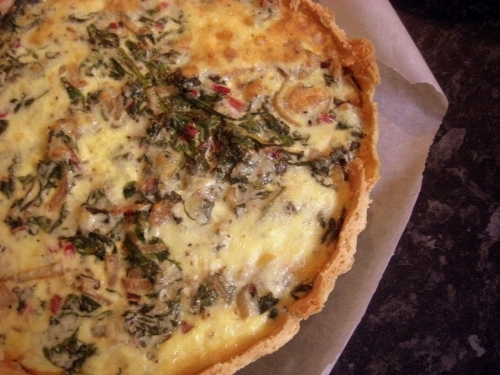 Once cooked, lay the chard and onion in the bottom of the tart and pour the eggy mixture over. Bake for 20-30mins until just set. Allow to cool for 10mins before serving.